Mount Errigal Hotel in Letterkenny is the perfect hotel for your visit to the north of County Donegal, Glenveagh National Park, and the stunning Inishowen Peninsula. 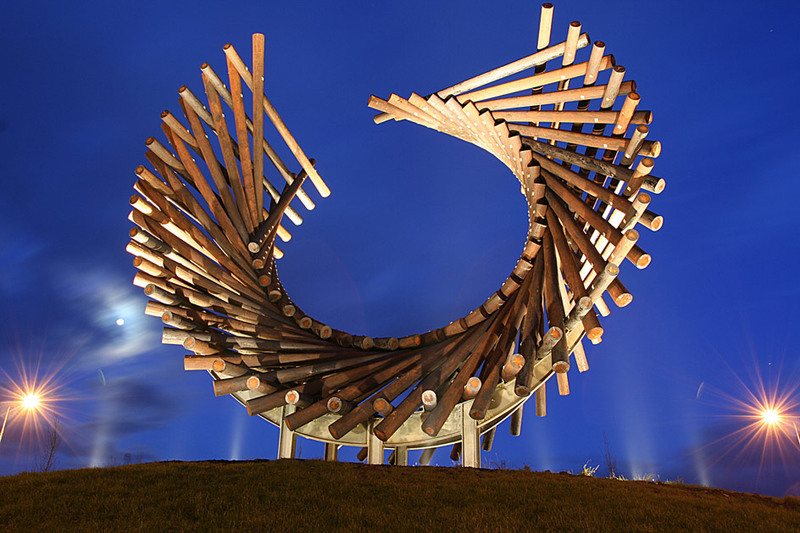 The hotel is easy to find as you enter Letterkenny via the N56 or N13/14 and is just east of the Port Bridge Roundabout and its stunning Polestar sculpture. At the far north of Ireland’s northwestern most county, Letterkenny is destination you plan, not one you visit on a whim while touring Ireland. We had spent most of our day driving from County Fermanagh, taking a long and winding route to Letterkenny. We arrived to a very full parking lot and a lobby filled with Irish Dancers. A feis (fesh), best described as as Irish dance competition, was going on. My little Irish dancers took their dad and went to watch the fun while I handled check in. The Mount Errigal Hotel has rooms of all sizes. As it was a busy weekend, the family room I had reserved had been upgraded to a spacious Master Suite. Twin beds had been brought in for the girls and the additional space was lovely. Decorated in rich eggplant and goldenrod, the room felt sumptuous. A large built-in armoire/ desk had more than enough room and the girls were excited for bath time when they saw the massive Jacuzzi tub. As we had spent the majority of the day touring, our evening plans went no farther than relaxing and eating. Thankfully the leisure club had recently re-opened after a complete remodel and we were able to unwind in the pools. Had I planned ahead a bit, I would have pampered myself with a pedicure in the spa while Doug and the girls splashed. Like many of Ireland’s larger hotels, the Leisure Club at Mount Errigal is open to the public via membership and available to guests of the hotel at no additional charge. In addition to the pools they have a full gym, fitness classes, whirlpool, sauna and, something I had never seen before, a plunge pool. A small, deep pool of cool water, a quick dip in a plunge pool is thought to offer health benefits – plus a bit of invigoration, I would guess! Our Family Package included both breakfast and dinner – which made the Mount Errigal an exceptional value. The buffet was large, with options that made everyone happy. The only disappointment here was for Caelan. She was on what we had begun to call a “hot chocolate tour of Ireland”. Absolutely everywhere we visited, she ordered hot chocolate. When she ordered it here we wondered if it had ever been requested; one of our servers told us she didn’t know how to make it. Dinner, served in the Cafe Renaissance Bar, was terrific. The All in Family Package has a special menu. For the kids there is a main entree and dessert, while adults get a starter and main entree. Though the menu isn’t large, there is plenty to choose from – and the portions are huge. Doug and I could have easily shared a starter and entree and be satisfied. Dining a bit late our second evening, we enjoyed live music in the bar. While the singer’s main audience was a generation past mine, his classic Country mixed with traditional Irish was fun and we joined in the dancing. Brenna even tried to line dance! It was great fun and a fabulous memory of our stay in Letterkenny. Ireland with Kids would like to thank the Mount Errigal Hotel for their hospitality during our stay in Letterkenny. We plan to return next year to continue touring the area!